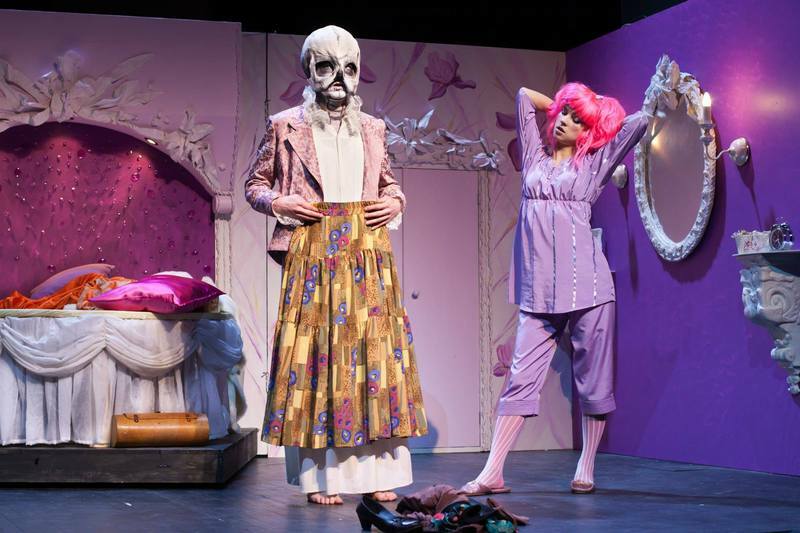 Mr Bones and Lulu in a play, staged by Ugala Theatre (photo by Jaanus Laagriküll). Princess Lulu lives a safe and perhaps even somewhat boring life in a big castle with her mom and dad. Then her toothpaste starts disappearing every night. The princess sets out to solve the mystery. Lying in wait, Lulu's efforts are met with success. It turns out that Mr Bones has needed the toothpaste to keep his skeleton nice and strong! The princess feels bad for Mr Bones, who has been hiding out in her father's tight squeeze of closet, and decides to show him a little bit of the world. Alas, they run into trouble, and Mr Bones jealously-guarded briefcase filled with state secrets disappears. Now the pair must get it back before the kings's great secret is revealed. "Princess Lulu and Mister Bones" in Italian. Published by Sinnos, 2015.